ORDINARY MOMMY DESIGN: Small Storage Solutions. Creative storage is a way of life over here. At least it's something I'm always brainstorming. In our 750 square feet of happiness there lives five humans, two cats, a homeschool, and a small business. Thank God for attic and basement storage. Because of my quest to organize our space to the max so that things don't seem overwhelming, all over the place and messy, I tend to compulsively purchase any and all storage boxes or baskets that wander into my path with a sale tag on them. It's a problem. Really. But because even buying storage on clearance can get expensive, I also never throw away a shoe box or mandarin orange container. Our kitchen has pretty minimal cabinet storage. We supplement with our old two shelf television stand and put the microwave on top. Quite a few years back we also snagged a narrow white decorative storage unit that was on clearance in the bathroom section of Target for $40. We use it to hold my tea and fancy tea cups in the glassed section, and plastic food storage containers in the bottom cupboard. 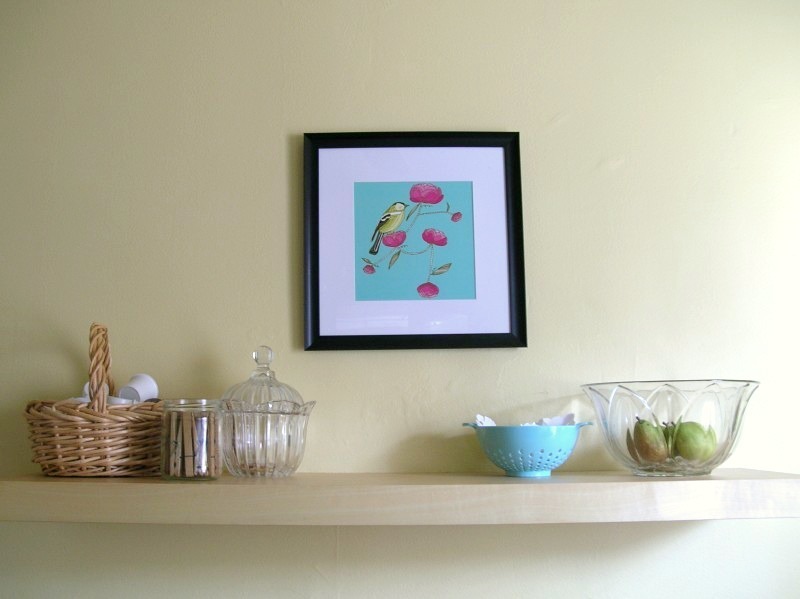 A few months ago we finally added a floating shelf above the small kitchen table that we use as a food prep area. Ironically, we purchased this shelf for our old apartment, and after we bought the house it sat up in the attic for almost five years. The shelf is now home to odds and ends like a fruit bowl, a basket from an Easter past that holds K-cups, and a salvaged glass jar that holds clothespins used for closing up bags of tortilla chips and frozen fruit. Refrigerators get messy enough with photos and calenders and kids' drawings plastered on them, so I think it is important to keep the top somewhat streamlined. This is valuable space that we need to store bread and boxes of crackers and cereal. (It doesn't always look this empty by the way.) 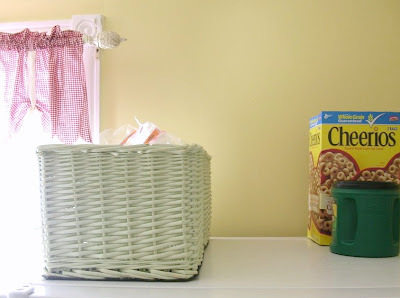 When we lived in our tiny apartment, we used the above green baskets to store my son's clothes on the shelves of a changing table that had been passed down to us. These also spent some time in the attic before we thought to remove the fabric liners and glue felt to the bottom so that they wouldn't scratch the surface of the refrigerator. 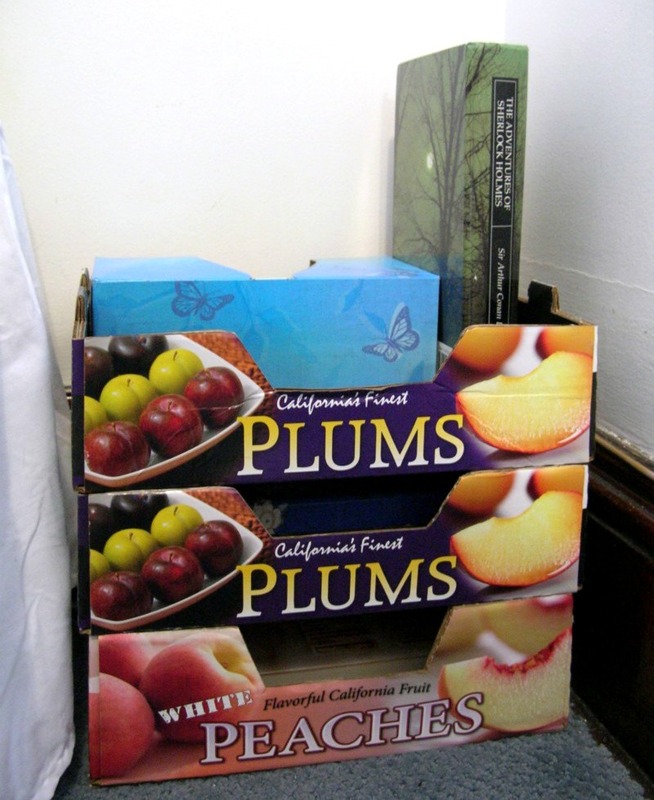 They work nicely to store and hide the mess of our bagged bread and bagels and chips and pretzels. 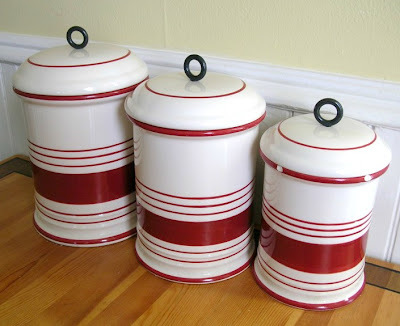 My husband picked up these ceramic canisters at a thrift store. We keep them on the kitchen table and use them to conceal packets of oatmeal, hot cocoa, dried fruit, popcorn, or whatever will fit into them. Sometime during my teenage years I saved this wooden recipe box from a rummage sale. 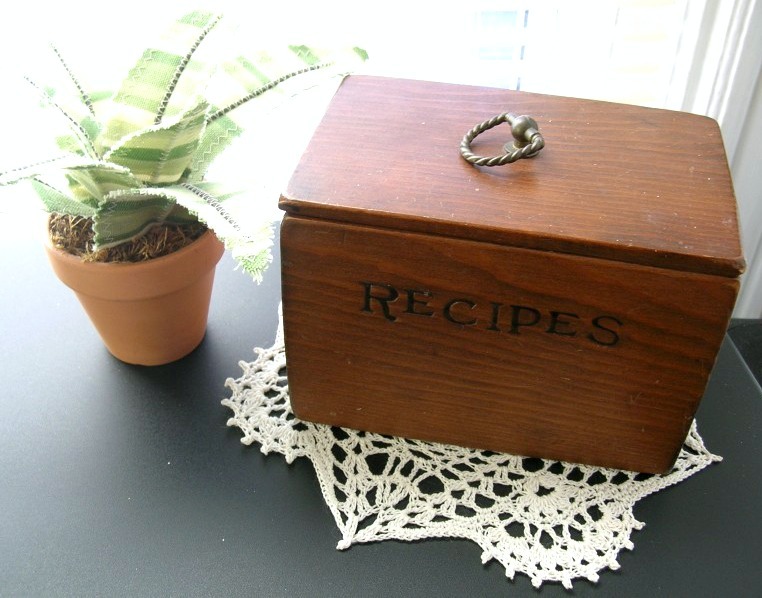 It doesn't hold recipes, but instead houses granola bars. Not only does our house have very few cabinets, it doesn't have a pantry either. 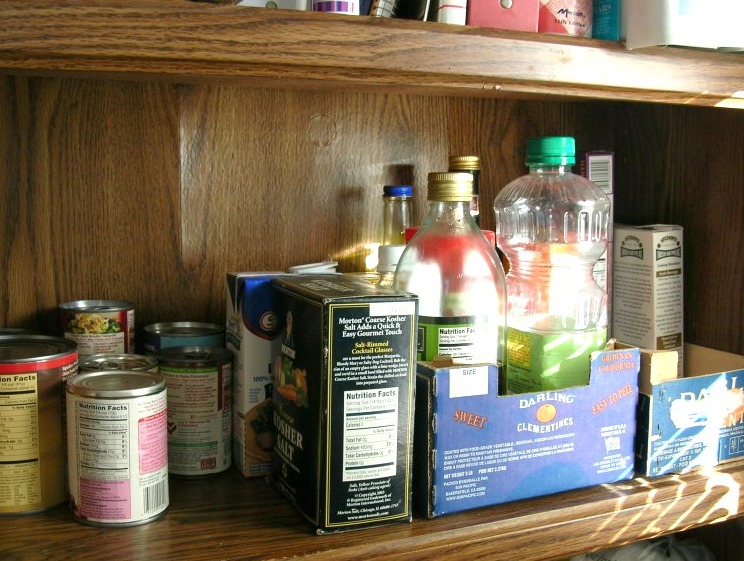 For the last five years we've been storing almost all of our food items on the 5 shelf bookcase that was in my husband's bedroom while he was growing up. To help organize it and keep like items together, we section off most of it with clementine boxes. This makes putting together a grocery list a little bit easier too. Other box storage that has been re-purposed for use around the house are shoe boxes. We have quite a few of them covered in kraft paper placed here and there around the whole house. I use them to store anything from loose DVDs in paper sleeves, to USB cables, business supplies, stickers for the kids, and Lego direction booklets to name a few. This is probably some of the ugliest storage you've seen in a long time, but these cardboard fruit crates were just too useful to get rid of. I may eventually cover them, but for now they fit perfectly in the odd bit of space next to either side of our bed that is too small for a traditional nightstand. I just add to the stack when I get a new crate, as they fit together nicely. 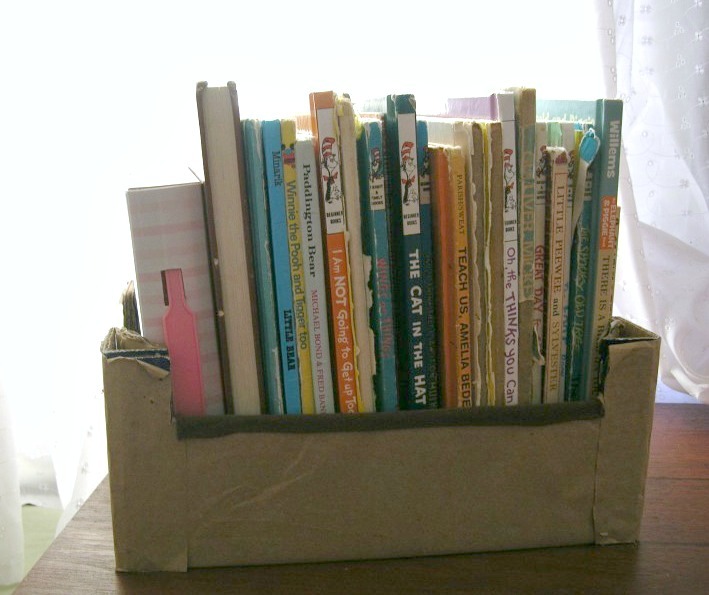 Each little cubby can hold a few books, and even bottles of water. 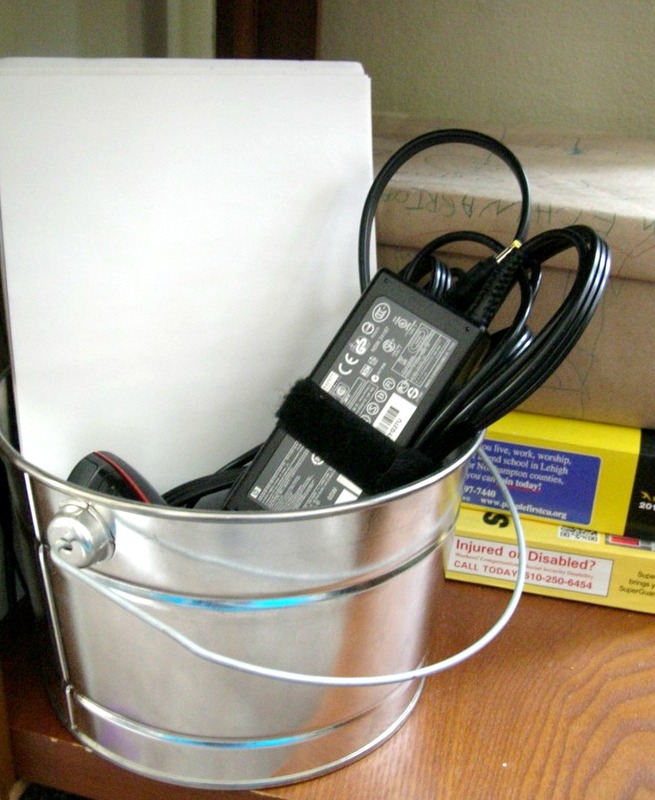 My husband purchased this shiny metal bucket in the painting section of a hardware store for a few dollars. It sits on the bottom shelf of our phone table to hold a tablet of paper, and the mouse and power cord for our laptop. 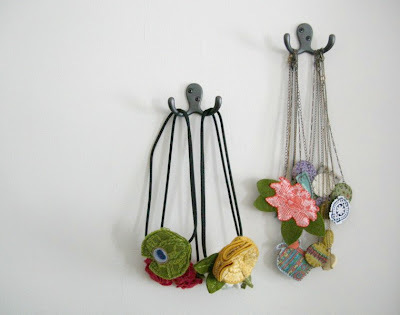 For the stash of headbands and necklaces I've acquired from having the shop, I had my husband hang two inexpensive metal robe hooks on the bedroom wall. Not only do they keep my accessories where I can easily see them, but they look pretty too. Thanks for reading! 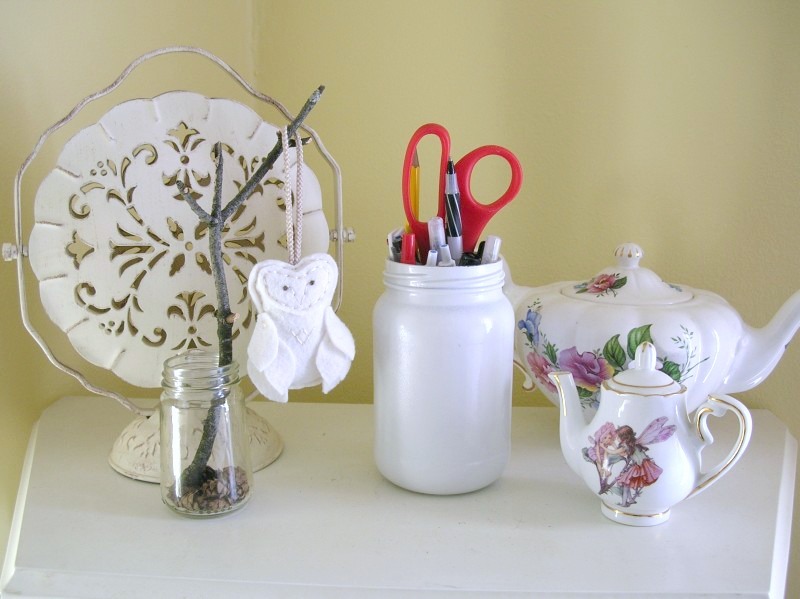 I hope you've been inspired in your approach to small storage solutions. For more home storage and organizational ideas, see my organize page. 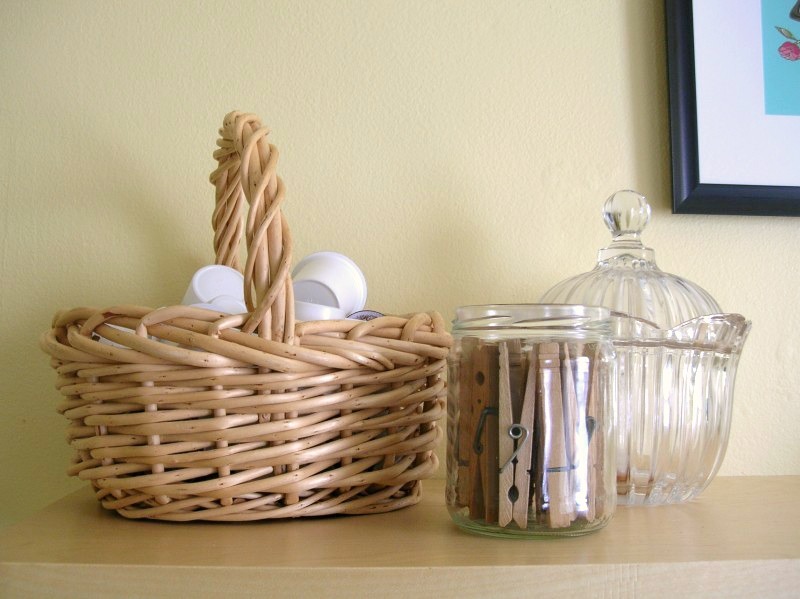 Please feel free to share ways that you've re-purposed items to use as storage in the comments below! The green scarf in the top photo was screen printed by Michelle Brusegaard, the bird and flower print in the kitchen is from Gingiber, the sweet fabric plant is from Jane Joss, and the wee chalkboard bears were made by Handy Maiden. Clever use of a small space here! Great ideas! 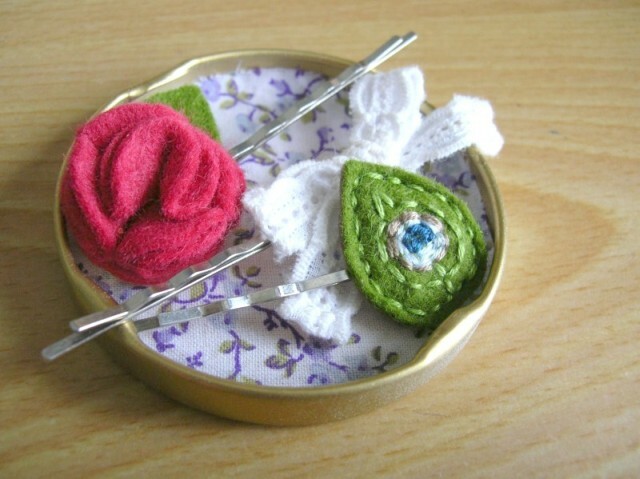 Being creative is so important when you have a small house! 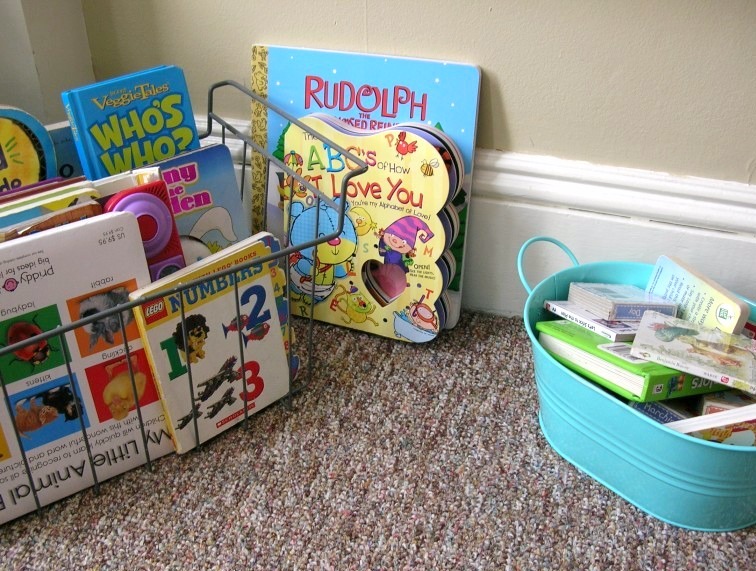 wow you are a master organizer! you've got skills. I am dribitemy going to save clementine crates from here on out. 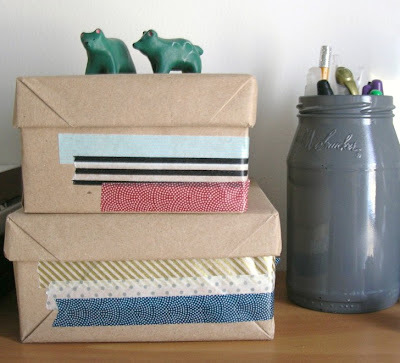 and I love the idea of covering shoe boxes with Kraft paper - love the look of 5those!